Dentists frequently encounter worn dentitions requiring bite opening procedures prior to restoration for functional and/or aesthetic purposes. Theories and techniques for finding the optimal relationship of the jaws at the desired inter-dental relationship abound, but none are definitive. All are limited in accuracy and reliability by the fact that mandibular movements and tolerances are highly individual and often unpredictable. Likewise, aesthetics is subject to personal taste and should be verified by the patient prior to starting definitive therapy. Click this image for a short and revealing video by Dr. Martin B. Goldstein as he demonstrates the Template Technique in detail. The OverTemp Technique is designed to interface with all jaw positioning systems. It is a fixed interim step used to verify optimal mandibular position and aesthetics, prior to dental restoration. Aesthetic preferences are determined in advance via accurate cosmetic simulations. Models of the dental arches are mounted on an articulator of choice in the chosen relationship. 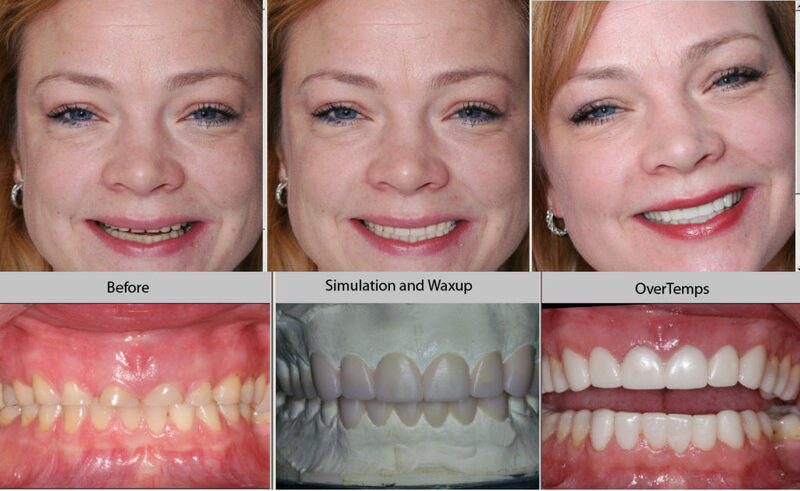 A waxup representing the desired final result is created to fulfill the occlusal and esthetic criteria for the case without altering the dimensions of the existing teeth (wax is only added). If slight tooth reduction is necessary, the areas will be marked on the model. The lab creates OverTemps, made of Radica, which are then bonded into place in the mouth. The OverTemps can be adjusted in the mouth to the patient’s satisfaction. Once the new aesthetics and occlusion are verified, tooth preparation can begin in whatever sequence is appropriate. Since the patient is stabilized, there is no need to prepare and temporize many teeth in one sitting. Occlusion and aesthetics at a new vertical dimension and maxillary/mandibular relationship can be adjusted and approved by the patient prior to tooth preparation. It offers assurance and confidence to all prior to proceeding to final restorations. Final restoration may proceed on a quadrant or half-mouth basis with assured retention of a satisfactory occlusal relationship and aesthetics.